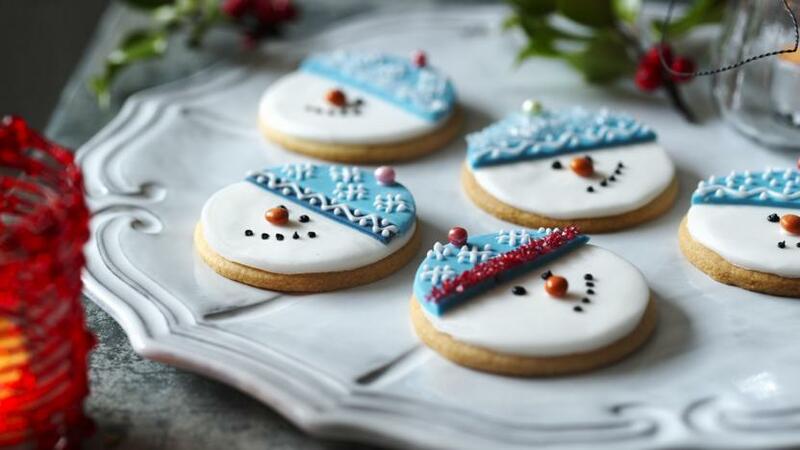 Follow our step-by-step guide to making these cute snowman biscuits. A great Christmas treat for children. Mix the flour and sugar together in a bowl, then rub in the butter with your fingertips until the mixture resembles fine breadcrumbs. Add the egg and vanilla essence and mix to form a soft dough. Roll out onto a well-floured work surface and cut into rounds. Place on greased baking sheets and bake for 10-12 minutes, or until golden brown. Cool on a wire rack. When completely cool decorate. Roll out the white fondant icing and cut out circles the same size as the biscuits, brush the backs of the circles with a little cooled boiled water and stick them to the biscuits, smoothing down the icing as you stick it on. Roll out the blue icing and cut out more circles, then cut these in half and using a little more water and stick on top of the white icing for the hats. Brush the hats with water in places where you want the sprinkles to stick and then sprinkle! Pipe decorations on the hat with the white writing icing, then pipe a small blob for the hat bobble and another for the nose – stick on the chocolate balls. Pipe black eyes and mouth then leave to set.